The movie of the same name is one of the great coming-of-age stories about a young man's fight to bring dancing back into Bomont, Texas. Some of popular music's best loved songs are included such as, "I Need a Hero", "Lets Hear It for the Boy" and "Almost Paradise". A thrilling musical sensation! AARIKA TRABONA (ensemble) is doing her first show here at PlazaCo. Some of her favorite roles include Chiffon in LITTLE SHOP OF HORRORS, Gloria in DAMN YANKEES, and Kat in LOVE, ALLEN a student film at OCU. She also has had the privilege of performing shows at Six Flags Over Texas for the summers of ’06 and ’07. She is currently a junior at Oklahoma City University majoring in Acting and is looking forward to moving to L.A. soon. She wants to thank her parents for the tremendous support and Michael for just being…well Michael! And thanks to JaceSon and Tina for this great opportunity! ADAM SHAW (Cop) is happy to be making his theatrical debut in FOOTLOOSE at Plaza Theatre Company. Though never before onstage, Adam is well versed in the art of running lines over and over and over again with his wife. Adam's other interests include woodworking, fishing, and convincing his family to let him buy a motorcycle. AMANDA ADAMS (Ensemble) is excited to make her Plaza theater Co debut. This is Amanda's 5th musical production to be involved in, the others being "Fiddler on the Roof" as a member of the chorus, "Joseph and the Amazing Technicolor Dreamcoat" as a member of the chorus, "Bye Bye Birdie" playing the role of Alice, and "Oliver!" which she had the role of a Strawberry seller. Amanda will be attending Tarleton state university in the fall where she will be Majoring in Music Education. Amanda would like to thank her friends and family of being so supportive and understanding her crazy busy schedule. She would also like to thank Jaceson and Tina for this wonderful opportunity. ASHLEE COLLINS (Claire) loves singing and being on stage, previously she was in The Promise in Glen Rose for 8 years in many different roles. Also Ashlee was the role of Mary in “The Majesty of Christmas” held in the Park right here in Cleburne Texas Christmas 2005. Ashlee is a Single mom of Hayden and loves spending anytime she gets with him and is also just very close to all of her family and being with them. So singing and acting are Ashlee’s Passions and she hopes to one day get the chance to do more of it on stage in the near future. AUSTIN SWEARINGEN (Travis) has enjoyed playing such characters as Jeff in CURIOUS SAVAGE, Charlie’s Dad in CHARLIE AND THE CHOCOLATE FACTORY, and Prince Charming in CINDERELLA at Cleburne High School, and The Ghost of Christmas Future, Young/Teen Scrooge in A CHRISTMAS CAROL , and Ensemble in MY FAIR LADY at Plaza Theater Company. Some of Austin’s favorite pastimes involve designing sets, and costumes. Austin is proud to be on the plaza stage again and sharing his joy of acting with his fellow cast members. Austin would like to thank his Grandpa for always telling him to reach for his dreams. BREE COCKERELL ( Ensemble) is excited to be part of her first Plaza production! At home on both the musical theater and the operatic stage, she was recently seen in the TCU/Fort Worth Opera’s Summer Festival as Rosine in Signor Deluso. Bree graduated in May with her Master of Music in Vocal Performance as well as her Graduate Performance Diploma in Vocal Performance from the Longy School of Music in Cambridge MA, where she studied with Jayne West. She has performed in Longy’s Vocal Department opera scenes as the Countess in Le nozze di Figaro, Baby Doe, in the Ballad of Baby Doe and Mariane, in Tartuffe. Other roles have included Cinderella and Little Red Riding Hood. As well as being an active theater performer, Bree is also an active recitalist having given her Bachelor’s, Master’s and Graduate Performance Vocal Recitals. This April she will be the featured alumni recitalist in Texas Wesleyan University’s Alumni Concert Series. Thanks to family and friends for everything. CAITLIN CARVER (Ensemble) is extremely excited to be in another Plaza Theatre Company production! After her first production of MY FAIR LADY, she was convinced that the theatre was where the fun was at! She lives in Cleburne, Texas with her Mom, Dad, one of kind brother, Jeffrey, and basset hound, Jax. Her hobbies include playing the piano, writing poetry, and singing. She is excited for the summer and scared for High School. But, all in all, she is thrilled to be apart of another Plaza production. "Thanks goes to Tina and JaceSon for putting up with me, yet again, and for everyone who pitched in and gave me a ride to practice when it was needed!" CAMILLE SHAW (Ensemble) is very excited to return to Plaza Theatre Company; she was last seen as Crystal in GHOST OF A CHANCE. Other roles at Plaza Theatre have included Florence in THE CURIOUS SAVAGE, Babette the feather duster in DISNEY'S BEAUTY AND THE BEAST, and has also played Florence and Pam in THE MAN WITH THE POINTED TOES, Ado Annie in OKLAHOMA!, and in several different roles at the Plaza Lolly-Pup roundup children's theatre shows. Some of Camille's favorite roles are Sylvia in SYLVIA, Sabrina in SABRINA FAIR, Haversham in THE BUTLER DID IT, Annelle in STEEL MAGNOLIAS , and Maggie in LEND ME A TENOR. CHERI DEE MEGA (Ensemble) is delighted to be working with JaceSon and Tina again, two of her favorite directors! She has been musical director or pianist for numerous productions at CATS and Artisan Center Theater and was the Music Director for the launch of PlazaCo with GOOD MAN...CHARLIE BROWN. Favorite previous involvements include BIG RIVER, GODSPELL, SEVER BRIDES FOR SEVEN BROTHERS, BEST CHRISTMAS PAGENT EVER, WIZARD OF OZ, and JOSEPH AND THE AMAZING TECHNICOLOR DREAMCOAT. She teaches private Piano, Guitar and Voice. Cheri would like to thank her husband, Brian for letting her play at this very fun hobby and as always she's having a blast doing all of this along side her son, Curt. Thank you most of all to Jesus for energy and the grace to keep going and to Him be all glory. DANIEL SCOTT ROBINSON (Chuck) is excited to be returning to the Plaza Stage. His last show that he did at Plaza was Beauty and the Beast where he played Lefou.Daniel's last show he did was Jesus Christ Superstar. Coming up next he will be in Peter Pan. Other shows that he has done in the past are, The Music Man, Annie Get Your Gun, Grease, OZ!, The Complete Works of William Shakespeare, Guys and Dolls and 42nd Street. On his days off he plays the drums, naps a lot and takes care of his three other roommates (Which he loves). He would like to thank his Mommy, Dad, Family and his "TIRES" for supporting him in all he does even if they aren't the smartest ones. Philippians 1:3! DARCY FARRINGTON ( Vi Shaw) Was last seen on the PT stage as Verna in Ghost of a Chance. Favorite Plaza roles include Abby Brewster in Arsenic and Old Lace, Miss Skillon in See How They Run, and Vera Sanders in Smoke on the Mountain. Other favorite rolls include Miss Hannigan (Annie), Golde (Fiddler on the Roof) and multiple whacky characters in Lucky Stiff. Past experience includes director, choreographer, studio vocalist, vocal coach, percussionist and live sound engineer. Darcy enjoys serving as vocalist, percussionist and drama leader at her church, and working her day job in the financial planning arena. I’d like to thank the Lord for the gifts and talents He’s given me. To the Plaza Producers: I love you guys. It’s an honor to be a part of your dream and the Cleburne Community. 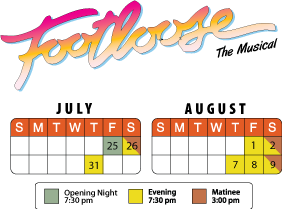 DARON COCKERELL (Bobby Sue) is excited to be a part of this FOOTLOOSE production! Favorite roles at Plaza include Eliza in MY FAIR LADY, Belle in BEAUTY AND THE BEAST and Martha in THE SECRET GARDEN. A graduate of Texas Christian University, she is currently wandering aimlessly toward a career and is thrilled to have stumbled across this amazing theatre community along the way. She sends thanks to her family and friends...and to JaceSon and Tina for believing that she would be a wonderful "Adult Number Two from the left!" DEMARISE BARBER (Ensemble) This is Demarise first show at PlazaCo. She did not give us any information about her to put into the program but we are glad to have her here though. DJ HENDERSON (Bickel, Cowboy Bob) is excited to join the cast again at the Plaza after closing up "My Fair Lady" last month. D.J. is a native of Cleburne ans enjoys singing and playing guitar. He would like to thank his family and friends for all of their support. FAITH MERRIFIELD (Ethel) is no stranger to Plaza theatre Co. From those delicious truffles that maybe in your hand right now to her talented vocals. Some of faiths previous roles include Ayah in Secret Garden, A Silly Girl in Beauty and the Beast, Denise in Smoke, Annie in Annie. In her spare time she is a stay at home mother where she cares for her beautifully talented children. Faith also directs the Lolly program at Plaza and the after school Community Education program at Cleburne I.S.D. This is faiths 2nd Adult Role EVER and she will be expecting her 4th child in October! Faith would like to thank her Husband Daniel and her family and friends for all there support and Jaceson and Tina. Dont forget to stop by the Concession stand in the lobby during intermission to get more Truffles.... they are really good i promise! HEATHER AIKMAN (Dorothy) is thrilled to be back onstage at Plaza after taking a behind the scenes look as prop master for GHOST OF A CHANCE. She was also seen onstage in BEAUTY AND THE BEAST. She attended Southwestern College, Winfield , Kansas on theatre and journalism scholarships. While in Kansas she appeared in SCHOOLHOUSE ROCK LIVE! & as the Stage Manager in SIX CHARACTERS IN SEARCH OF AN AUTHOR. She has garnered multiple awards at both the state and international level. She and her husband Nathanial are a part of the Youth Leadership Team at their local church where Heather also serves at Youth Choir Director. And yes she is related to a famous “Cowboy”! IRENE DENNISON HERR (Cheryl, rehearsal pianist) is humbled to be part of this production, her first with Plaza Theatre Company. For the past five years she has taught music and drama at Keene Junior High and High School. She is a graduate of Andrews University (B.Mus) and Southwestern Adventist University (M Ed) and music director at her church. As a teacher, she has directed many children’s dramatic musicals (sewing costumes, painting backdrops, and designing programs). Irene wants to thank Tina for inviting her to join the amazing talent in this show (and Cheri) and many thanks to Gary, her husband of 38 years and to her daughters for their confidence and support. Thanks to God for the gift of music. JAY LEWIS (Rev. Shaw) Jay is honored to once again be associated with another Plaza production. He portrays the Rev. Shaw Moore (Ariel's father). Most recently he has been seen in Plaza's My Fair Lady as Alfie Doolittle (Eliza's father) and Maurice (Belle's father) in Beauty and the Beast. Jay is also seen frequently in Carnegie Players productions. In the past year he's performed in Man of La Mancha and Joseph... Dreamcoat. In real life, Jay is the principal of Gerard Elementary where he looks forward to spending his days with 475 kiddos. Oh, by the way, Jay is a father in real life. xoxo's to John, Emma and wife , Shauna. JEFF ATWELL (Coach Dunbar) is filled with gratitude to perform on the Plaza stage once again and thanks JaceSon and Tina for the opportunity. He was previously seen in Plaza's Christmas Carol and Beauty and the Beast. He says his favorite roles, however, are being a husband to his beautiful wife, Christine, and a father to his two wonderful kids, Lauren and Garrett. He is anxiously awaiting the arrival of his third child. To his family: "Thanks for your support. I love you!". KASI HOLLOWELL (Ariel) Kasi Hollowell is new to the Plaza stage and is thrilled to be a part of this show. She has enjoyed being in musicals such as The Music Man, Cinderella, Honk!, 42nd Street (Andi Lee), Thouroghly Modern Millie (Mrs. Meers), Annie Get Your Gun (Nellie) and numerous plays with Burleson High School theatre including David's Mother and Don't Drink The Water. She will be attending Christ for the Nations Institute in Dallas in the fall and is excited to give the Dallas theatre scene a shot while she's there. Kasi would like to send all her love to the cast of Footloose, especially Jill, the Michaels, Daniel, and Baby Tyler. And thank you Aaron for giving me my new stage name; Shoshauna. KRISTIN PAYNE () and move right in to the 'thankyous'. Yay for Tina and JaceSon and Aaron and Milette for the most fun she's ever had in theatre, you guys really are amazing people. And finally, she would like to dedicate her performance in this show to her mom Kim, because Footloose is her favorite musical. Enjoy!!!! MEG POWELL (Assistant Stage Manager, Board Op.) is a junior at Southwest Christian School. She is very involved in her school's productions and loves theater. She has been in 14 SCS productions as crew, ASM, or stage manager. She also rides horses competitively. She would like to thank Stefanie Glenn for asking her to work on this show and her family for supporting her. She owes everything to her family and God. Break a leg!! MELODY HENDERSON (()) has been a great example through his work here at the Plaza and she looks forward to participating in upcoming shows as well. MICHAEL ANTHONY SYLVESTER (Ren, Choreographer) Footloose is Michael's 3rd show at plaza, 5th show to work with Jaceson and Tina, and 2nd show to choreograph for them! Plaza is Michael's new home away from home! Literally! He attends TCC northeast "while trying to figure out my life!" Michael choreographs all over Texas, pageants, show choirs, musical theatre, everything! Michael has also worked at SIX FLAGS OVER TEXAS, entertainment companies, auditioned for reality shows and the list goes on. Favorite roles include Chino in WEST SIDE STORY, Lumiere in BEAUTY AND THE BEAST, oh and the carpet at PlazaCo, Puck in A MIDSUMMER NIGHTS DREAM. Will be making his debut at Casa Manana with DAMN YANKEES with Lou Diamond Phillips! I want to thank my friends and Teachers for always supporting my dreams (*Renee, Faith, Angie,Abon, Connie, Don) Id be nothing with out your hardwork and commitment to excellence Oh and Garrett Walker!! Lan It dont Shkan it! Hahahah. MICHAEL SISEMORE (Willard Hewitt) is very excited about returning to Plaza for another show. Michael has been in numerous shows, He could most recently be seen as Freddy Einsford-Hill n Plaza's My Fair Lady, He was also Charlie Davenport in TCC Northeast Playhouse's production of Annie Get Your Gun, as well as Jack Palmer in Mountainview College's production of Boy's Next Door and Scarecrow in TCC Northeast Playhouse's OZ! Michael is superbly excited about playing Willard in Footloose, it is role he has had a lot of fun researching. After Footloose Michael can be seen as Captain Hook in Artisan Center Theatre's production of Peter Pan. Michael would like to thank Jaceson and Tina Barrus, Aaron and Milette Siler and Stefanie Glenn for this opportunity to work at Plaza Theatre Company again. He would also like to send love to all his cast mates and some special love to Kasi Hollowell, Michael Sylvester, Jill Baker, and his brother Daniel Robinson. He would also like to thank his boy Rob and his roommates Tim and Will. SHELBI LYNN MEISNER (Ensemble) is 13 years old and lives in Rio Vista, Texas. Shelbi has been involved in Theater for two years at the suggestion of her friend Jonathyn and also plays in the High School Band. thanks to all my family and friends who have really supported me through it all especially my mom Julie, my sister Holli and my grandma Jeanette. STEPHEN SINGLETON (Jeter) This is Stephen's third appearance at Plaza and he's thrilled to be working with JaceSon and Tina again. He's been Ben Whitledge in NO TIME FOR SERGEANTS at Artisan and he's been in OKLAHOMA and BEAUTY AND THE BEAST here at Plaza. Stephen likes playing guitar, piano, violin, and singing. '' I know God has a plan for me, and I will honor Him in whatever He has for me.'' Thanks to Curt, Joey, And Buddy for being other brothers. Also, thanks to Mary and Michelle for being other sisters. And also thanks to Cheri, Mom, Dad, Michael, Tim, Beka, and Jesus Christ for always being there. TABITHA BARRUS (Urleen) Is thrilled to return to the Plaza stage! Tabby is a home-schooler who enjoys reading, writing poetry, and doing shows, shows, and more shows. Some of Tabitha's favorite roles include: "Mary Lennox" in THE SECRET GARDEN at ACT in Hurst, "A Silly Girl" in BEAUTY AND THE BEAST and "Martha Crachit" in A CHRISTMAS CAROL both at Plaza, to name a few. She sends love to her wonderfully supportive family and her fantastic friends (ROW)! Most especially to Park, Cam, Edy, and Mimi! "You'll never stand as tall as when you're on your knees." TAYLOR SMITH (Anne) is delighted to be back on the Plaza stage after having one entire day off after My Fair Lady. Taylor is a student at Hill College and has been performing since the age of five through church productions and youth community theatre. Taylor would like to thank her parents, "I couldn’t do without you", “Twitchy, you are all like zippy-zoom”, and JaceSon and Tina for yet another amazing opportunity. Tab, Caitlin, and the entire Footloose Cast and Crew-you are so very special! Thank you for allowing me to be a part of your lives!" TED UNG (Principal Clark) is glad to be back among his Plaza Theater Company family. He enjoyed greatly his roles here as Fezziwig in "A Christmas Carol" and Judge Carnes in "Oklahoma!". Other favorite roles include Lieutenant Gardella and The Colonel in "No Time for Sergeants". Thanks to his supportive wife, Marilyn. Ad majorem gloriam Dei. TONYA LAREE (Eleanor Dunbar) is thrilled to be in another Plaza production. You may have seen her recently as Lily Belle Savage in THE CURIOUS SAVAGE or in Plaza's Lolly-Pup Roundup production of LITTLE RED RIDING BOOTS as Mama and Grandma. She was also in the ensemble of a production of The ROCKY HORROR PICTURE SHOW at KD Studio's in Dallas. Tonya wrote her own Indi short called THE DEATH OF JACKSON BOOKER in which she played Sarah Chandler. She also helped to produce a feature length local Indi film called PROJECT CLEAR VISION, based on actual events, in which she played Reporter Karen Kennedy. Tonya has also been an extra on such TV shows as WALKER, TEXAS RANGER; The Reunion Show, PRISON BREAK, and both Lifetime Movie Networks Movie of the week INSPECTOR MOM as well as several of the pod casts of INSPECTOR MOM. Tonya would like to thank Plaza's producers for their love and encouragement and her family and friends for their love and support. TYLER PATTERSON (Ren) is 17, and graduated from Burleson High School in 2007 as a three-year graduate. During high school, Tyler was a part of the advanced Theater Productions class, in which he performed in many productions and competitions. He won 5 consecutive "All-Star Cast" awards for his performance as an autistic child in the UIL one-act play "David's Mother" during the conclusion of his senior year. After Graduating, Tyler trained with the contemporary ballet company, Push Comes to Shove. Tyler was also an intern for Casa Manana's production of Cinderella at Bass Performance Hall. Tyler attended TCC Northwest and South campus for the 2007-2008 school year, and is now looking forward to his sophomore year at UNT where he will be majoring in Theater, and continuing his education in Dance and Music Theory.